Take a trip to the amazing Assembly Square, developed to celebrate ten years of LEGO Modular Buildings, featuring a wealth of unsurpassed, intricate details and hidden surprises. Easy-to-remove building sections provide access to the highly detailed interior, comprising a ground level with a bakery, florist’s shop and café, a middle level with a music store, photo studio and dental office, and an upper-level dance studio and apartment with access to a rooftop terrace with barbecue. The exterior of the building features a detailed sidewalk with outdoor café furniture, fountain, streetlamps and a highly elaborate facade with beautifully detailed windows and doors, three buildable shop signs, spired tower and a decorative roofline. Collect and build an entire town with the LEGO Creator Expert Modular Building series 10243 Parisian Restaurant, 10246 Detective’s Office and 10251 Brick Bank. Includes eight minifigures and a baby figure. 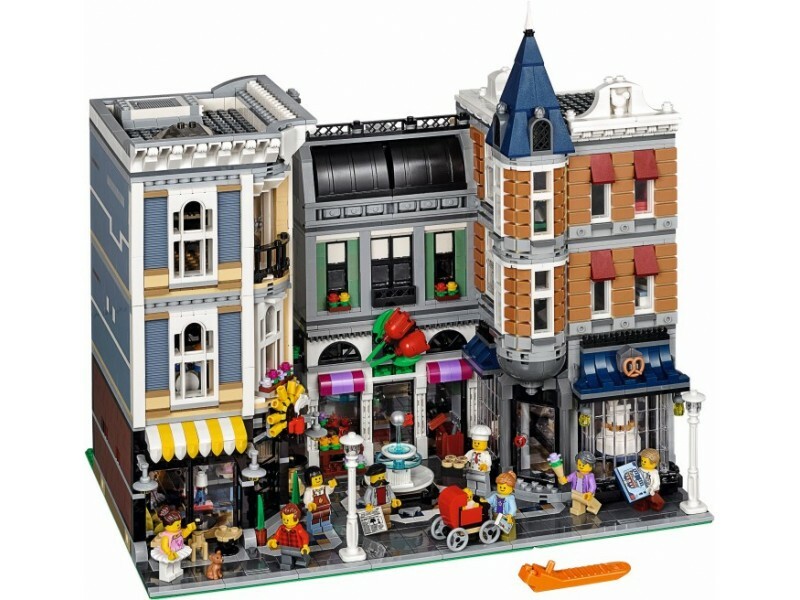 Includes eight minifigures: a dentist, barista, baker, florist, music store assistant, dancer, photographer and a LEGO fan, plus a baby figure. Upper level features a dance studio with buildable piano and reflective mirror element; an apartment with buildable foldout sofa bed, detailed kitchen, toilet, micro LEGO train, modular buildings and Eiffel Tower, and access to a rooftop terrace with buildable barbecue, table and a neglected plant. With over 4 000 LEGO pieces, this model will really put your LEGO building skills to the test! New-for-spring-2017 decorated elements include a dentist torso, dentist window and 2x3 tile with the 10182 Café Corner box front. Includes lots of curved and corner angle tiles, garage doors used as box windows and LEGO Technic excavator scoops used as roofing elements. Measures over 35cm high, 38cm wide and 25cm deep.